Cook broth and pasta sauce in large saucepan on medium heat 5 to 7 min. or until heated through, stirring occasionally. Add fennel, carrots, potatoes and celery; stir. Simmer on medium-low heat 15 min. or until potatoes are tender, stirring occasionally. Add remaining ingredients; stir. Cover; simmer on medium-low heat 3 to 5 min. 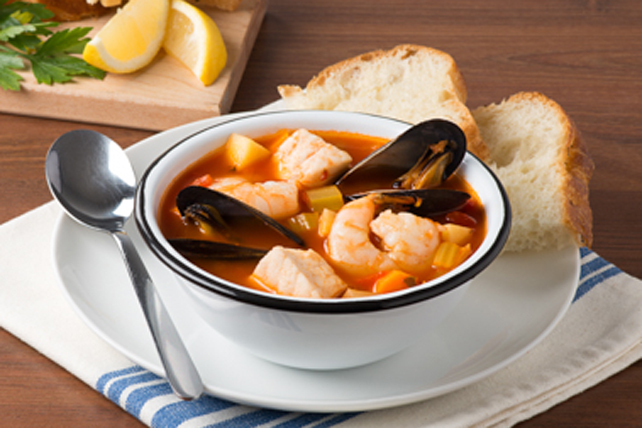 or until haddock flakes easily with fork, shrimp turn pink and mussels open. Remove and discard any unopened mussels before serving soup. Stir 2 Tbsp. chopped fresh parsley into hot soup just before serving. Serve with lemon wedges; squeeze over individual bowls of soup. Rinse mussels under cold running water, pulling or scraping off the beards, also known as byssal threads, that are attached at the bottoms of the shells.